Icecream Media Converter handles video to video, audio to audio and video to audio conversion to and from multiple formats. The program features batch conversion mode, adjustable output quality and ability to convert files by format and by device. 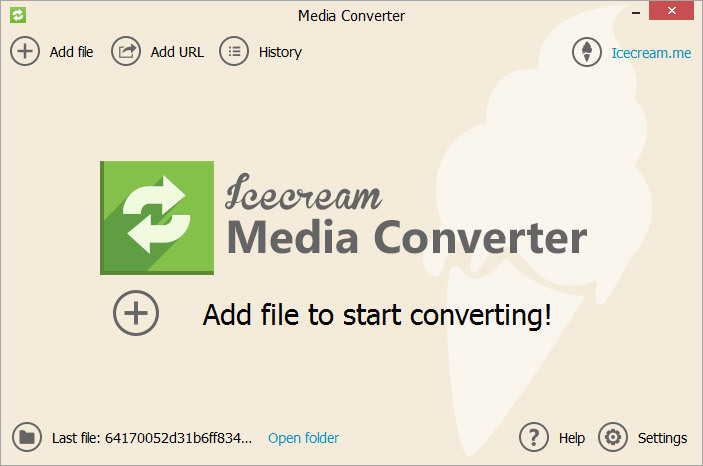 Icecream Media Converter deals with all types of audio and video files and offers high quality conversion. In spite of the visual simplicity, the program features some advanced options that give the users better opportunities for different types of conversion.Icecream Media Converter has intuitive interface, attractive design and high efficiency give an outstanding user experience. Batch conversion support makes the program even easier to use as you can just queue the files, set the desired configurations, and convert files in bulk.The program allows you to convert files by format or device. If you know which exact format you need to convert to (MP4, MP3, MKV, MOV, FLAC, WAV, M4A, M4V, AAC, SWF, AVI, FLV, WMA, OGG, VOB, WMV, etc. ), you can simply select it from the list. Alternatively, you can convert files by device (Phone, iPod, iPad, Xbox, Android, BlackBerry, PSP, PS3, Samsung, Nokia smartphones, etc.) by specifying it in a corresponding section. In this case, the application will automatically set the recommended characteristics for this particular device.Using Icecream Media Converter, you can play with the quality and adjust it prior to converting a file. The choice depends on your needs, if you are looking for an original quality, set the Best one, in case you need to compress a file, choose lower quality options.With all these features and characteristics, Icecream Media Converter turns out to be a powerful yet simple application for successful and quick conversion. Perfect balance between simplicity and versatility makes this tool a great solution for your conversion needs. 4Easysoft Mod to MOV Converter enables you to enjoy videos Mod video recorded by a tapeless camcorder on iPod, iPhone, Apple TV, PSP. This Mod to MOV converter not only can convert Mod to MOV, but also can convert MPEG, MPG, VOB, Tod, etc. 4Easysoft Mac FLV to MPEG Video Converter provides you with the fastest and easiest way to convert FLV to MPEG on Mac and also convert SWF to other popular videos. 4Easysoft XviD Converter is designed XviD Converter to convert any video like AVI, MKV, WMV, MP4, MOV to XviD, DivX, MPEG4/H.264, 3GP and HD video. It can also extract audio from all the video formats and convert to AAC, MP3, M4A, MP2, WMA. 4Easysoft Total Video Converter can convert all mainstream video and audio formats, support all popular portable multimedia players and extract audio tracks from video files to other audio formats and edit video - merge, effect, trim, crop, etc. Convert AVI to VCD, convert avi to DVD, Convert AVI to MPEG and any kinds of media(movie), mainly on how to convert AVI to VCD / convert AVI to DVD, vob to vcd, vob to dvd . Making your own VCD, DVD or SVCD.